Written by Catherine Joy, a volunteer and intern of Stepping Stones. Catherine is a senior at Indian Hill High School. Every year, organizations around the country choose to celebrate National Volunteer Week in April to honor those individuals who choose to give others their time so generously. This tradition has many origins, but in the United States in specifically grew from the popularity of Points of Light by the late President George Bush. The nonprofit coordinates thousands of volunteer projects throughout the entire year, with special events held during National Volunteer Week. The role of a summer camp volunteer at Stepping Stones is an active, adventurous and challenging one. Yet, it’s also an experience that leaves an indelible mark on those who come to help out during our programs for people with disabilities. Albert Kwon has volunteered at our camp for several summers. “It gave me so much perspective into the lives and personalities of people with disabilities – much more than any presentation or class could. Volunteering helped me be more a more understanding and empathetic person. And, I have learned that the phrase ‘don’t judge a book by its cover’ is a really good message and always applies in this case. Starting to think that volunteering is mostly about giving to others? Know that there is also considerable payback through the rewarding relationships student volunteers develop. Senior Payton Hoffman spent close to 200 hours volunteering at Summer Day Camp last summer had this to say, “It was so rewarding to help a camper named Jacob overcome his fear [of jumping in the pool] and to learn that new experiences can be scary and fun.” At camp, Payton helped Jacob tackle his fear by helping him see that a swimming pool is really just a giant bucket of water. 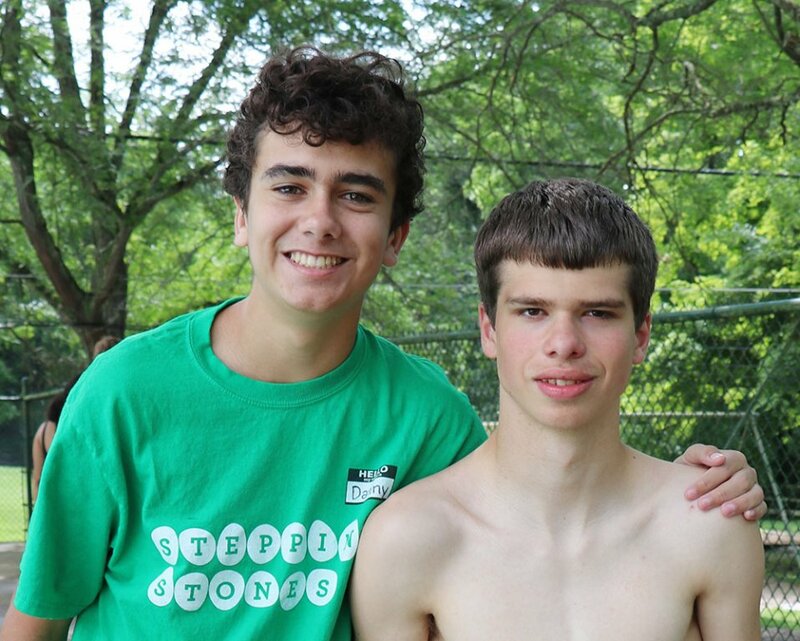 Stepping Stones was founded in 1963 as Greater Cincinnati’s first summer camp for children with disabilities. We have a long history of providing children and teens with fun adventures in a safe space and our volunteers are big part of that experience. By volunteering at Stepping Stones, high school students are able to earn service hours while changing lives and gaining perspective. Our 2019 summer camp season kicks off Monday, June 10 and runs through Friday, August 3. Stepping Stones welcomes volunteers over the age of thirteen to join us for a rewarding experience! To learn more about how you can volunteer at Stepping Stones this summer and complete an online application, click here. 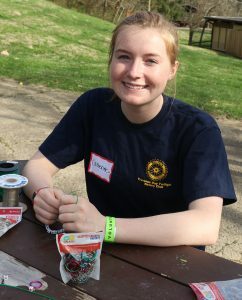 Article written by Indian High School Senior Catherine Joy – a volunteer and intern of Stepping Stones. 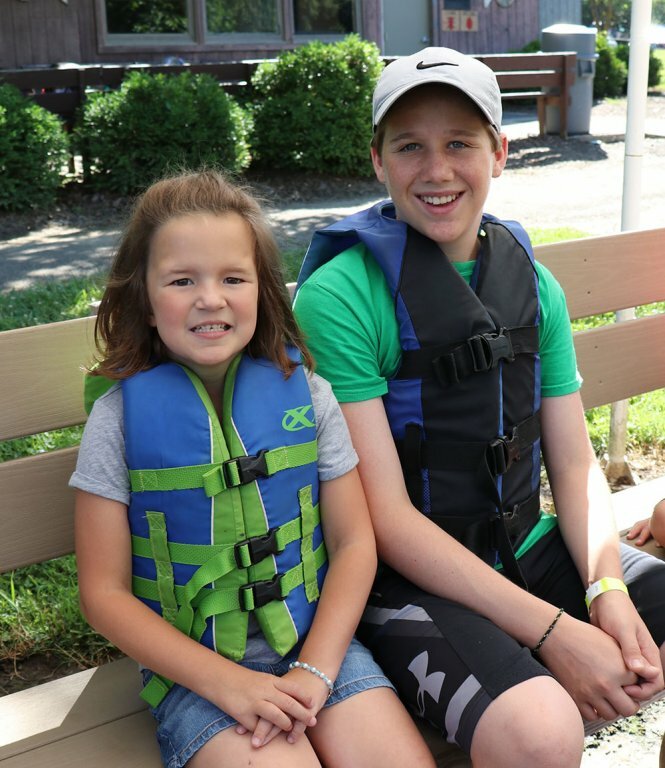 Indian Hill High School student Andrew Heekin (left) helps camper Maria get ready for fishing at Summer Day Camp. Volunteers Cameron Rabenold and Lauren Sewell connect at the end of a day volunteering at camp. 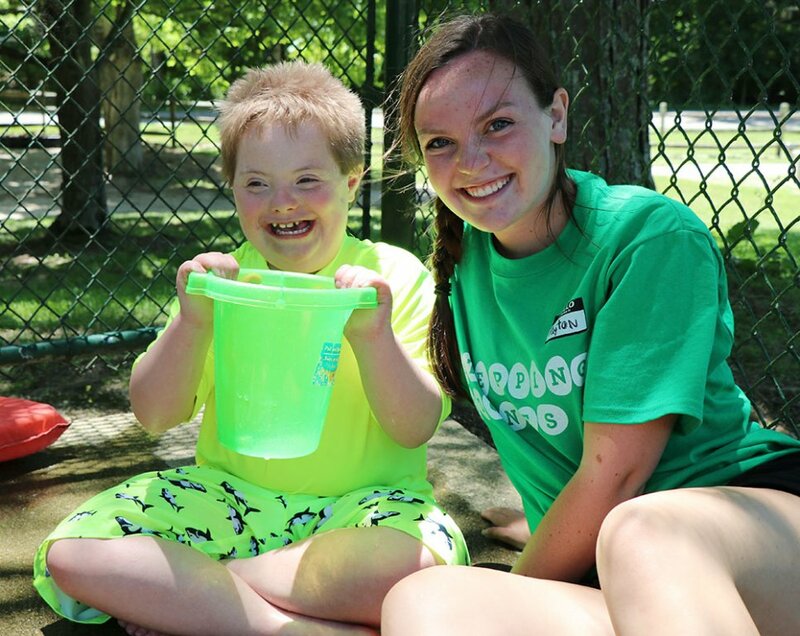 Volunteer Danny Forte and camper Cass enjoy some time by the pool. During her time at Summer Day Camp, Marina Anderson (second from left) discovered the joy of giving to others through volunteering. Camper Jacob and Indian Hill High School Senior Payton Hoffman. 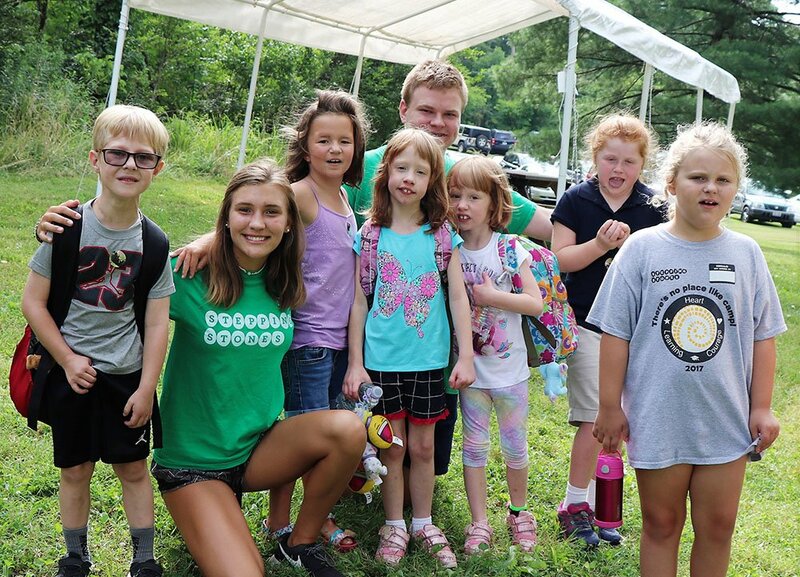 Payton volunteered an impressive 200 hours at Day Camp in Summer 2018. 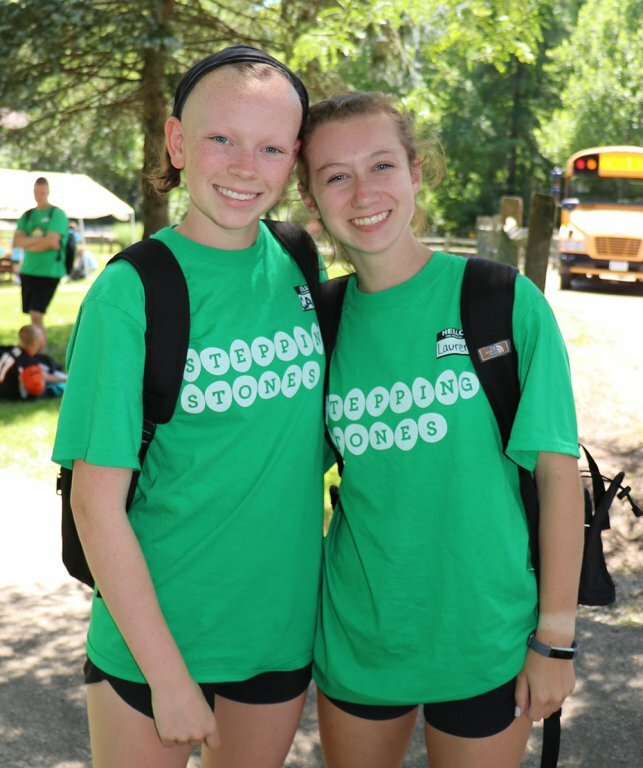 At Camp, Payton Hoffman (right) also made friends reunited with Grace - her former second grade classmate.